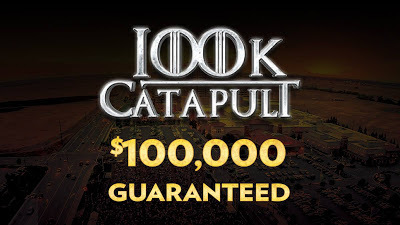 Last night was huge, today should be huge, Saturday should be as well ... this is the Catapult, a $100,000 guarantee for just a $160 entry. Twice this tournament has been held at Thunder Valley, and the overall field size was more than 1,000 each time. Start with 12,000 chips , play 20-minute levels during registration and play 30's until bag-n-tag. The top 10 percent of the starting field cashes, while play ends when down to 8 percent. The Structure Sheet has a full breakdown by field size as to the qualifying fields. Check out the structure sheet for this and all Ante Up Worlds events here.